This post will discuss how to climb your Boeing airplane in a efficient manner. I have witnessed many streams and planes on the network that may appear they do not how this is done. This is probably the most commonly used AP function in climbing your airplane up to altitude. What does VNAV do however? Well next time your flying take a look at your PFD (Primary Flight Display) and it will say N1, LNAV, VNAV SPD. This is telling you the FD (Flight director) and it turn the AP are doing. In basic terms this is commanding the airplane to go to the N1 setting for CL (climb) and climb the airplane on the VNAV SPD which is set in the FMS. So the airplane is pitching to maintain that speed, whichever climb rate you achieve will be based on weight, weather, etc...If the speed starts dropping the FD will lower the lose, conversely if the airspeed starts increasing the FD will pitch the airplane up. This is a screenshot of this type of situation. The VNAV SPD is all controlled through the FMS on the CLB page. It will have stuff in there such as CRZ ALT, TGT SPD, and SPD/REST. They have similar but different functions. The TGT SPD is what VNAV will follow when you see VNAV SPD in the PFD. Lets say ATC issues an instruction departing a busy airfield, "AAL123 maintain 280kts in the climb until advised". To accomplish this you have a few options. 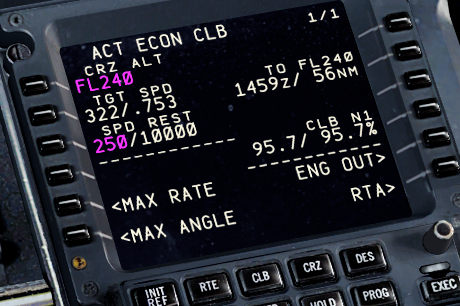 As in the screenshot above you can go to the CLB page of the FMS and change the TGT/SPD to 280kts. This method is generally only used when the pilot expects a long climb at 280kts, to revert back to normal speed simply hit the ECON button. Another method is to simply just hit the SPD INTV button on the autopilot control panel. This allows you to manually override the VNAV SPD without having to go through the FMS. If ATC issues normal speed you simply hit the SPD INTV button again and it reverts back to FMS control of the SPD. These methods both accomplish the same thing while maintaining VNAV SPD. Ok so you hate VNAV or its simply not working for you on this flight today. Thats OK!! We have other options you can use to accomplish the very same thing. 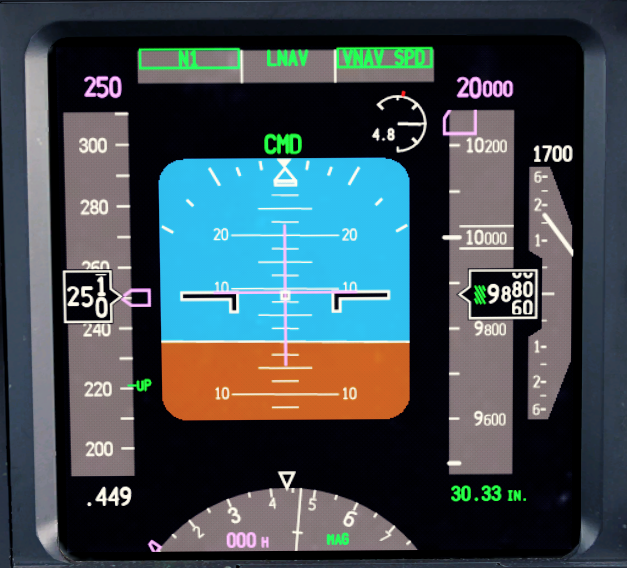 LVL CHG on the AP control panel will allow you to climb in N1, LNAV, MCP SPD. What does MCP SPD mean? It simply means your climbing at the speed set in the Mode Control Panel (autopilot IAS/MACH window). The plane flies exactly the same it does in VNAV minus the FMS is not in control of it, the pilot is. Also when using this mode NO ALTITUDE RESTRICTIONS ARE PROTECTED. Whichever altitude is set into the ALTITUDE window the airplane will climb up to at the speed you set, so if your issued a climb VIA you have to manually set in any altitude restrictions manually. Of course finally you have the V/S MODE (vertical speed) this is the most INEFFICIENT way of climbing. Why is it you ask? Well airplanes save fuel the higher and quicker they get to altitude. By using V/S in a climb you may be limiting how quickly you can reach higher altitudes. The F/D commands the airplane to the following MCP SPD, LNAV, V/S. This means the throttles will go to whichever setting is needed to maintain that speed, and the airplane will pitch to whatever it needs to maintain the set feet per minute. This mode can lead to STALLS if your not careful, another reason why pilots will hardly EVER use this mode while climbing to altitude. Why is a stall a threat when using this mode? The airplane prioritizes V/S over any other mode, so if throttles are at the max they can go the airplane will maintain its pitch to hold that 1,800 ft per minute, no matter what. As you climb that airspeed will slowly bleed off and if your not watching will lead to a stall. I hope this provides a little insight to how Boeing airplanes manage their climbs. It is important to be familiar with all modes your MCP can do and what they mean when flying in a online environment. Next time your flying try some of these techniques and see how the airplane performs differently. This example I used a 737 as it is probably the most common flown Boeing airplane out there, there may be small differences in other Boeing aircraft, but they should all follow this basic guideline. Thanks so much, Matt, great insights. I look forward to a Descent version (that's where I sometimes run into "oddities"....). Thanks! You mentioned SPD INTV but not ALT INTV, but for those who don't know, ALT INTV works the same as how SPD INTV was described. You can clear the next altitude restriction by hitting ALT INTV. Great write up Matt! Thanks! completely forgot about that one! Is this type of format good for a post? or would everyone like to see videos instead? I’m good with the reading. Perhaps we should collaborate with ATC staffing and try and record some demo examples of being issued “climb via” vs “climb and maintain” and also being assigned speeds, etc. and make some short videos.